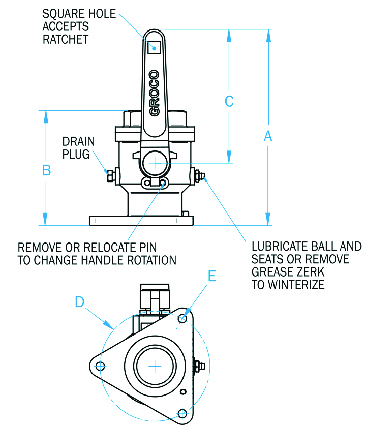 1-1/4" sizes and larger include one grease zerk fitting for lubrication (use only with the valve in the open position), and one drain plug. The zerk can also be used for draining. 3/4" 3/4" 5.75 3.5 3.8 3.12 5/16"
1" 1" 6.63 4.13 4.4 3.38 5/16"
1-1/4" 1-1/4" 7 4.5 4.4 3.62 5/16"
1-1/2" 1-1/2" 8 4.63 5.5 4.5 5/16"
2" 2" 8.38 5.25 5.5 5 3/8"
2-1/2" 2-1/2" 10.31 6.75 6.5 5.88 3/8"
3" 3" 13.5 7.75 9.5 7 3/8"
4" 4" 19.2 9.6 14.1 8 1/2"
5" 5" 19.9 11.2 14.1 11 5/8"